I found out recently that a part time social media job I've been doing for a statewide website will be coming to an end, as the website is being sold to a private company. While it wasn't a lot of money, it did pay at least 2/3rds of the grocery bill each month, if not more. So we need to find a way to tighten our budget even more. We've already cut out so much that it's hard to find additional ways to trim, but the most obvious area is the grocery store. While we raise our own chickens and eggs, and garden, there are many things we purchase weekly from the store. I'm going to try to trim that back for now. And as a result of trimming that back, I'm trying out new, portable snacks that I can make for the boys at home. My Baylor cookbook has a recipe called The Best Cheese Straws. I had never made them before, but let me tell you - instant hit in my family! They are divine. If you're craving some cheesy goodness you will love these. Just the right combination of softness and crispness, with a wonderful flavor, they are the perfect snack for kids and adults alike. In a large mixer bowl, beat cheese with butter, salt, and cayenne. Add flour, a small amount at a time. Mix well. Put dough in a cookie press using the ribbon disc. Make long strips on a cookie sheet and cut into preferred sizes. Bake at 350* for 12-15 minutes. Yield: 2-3 dozen. If you don't have a cookie press, you could roll this into long snakes and trim into the size you want. They wouldn't be as pretty, but they would still taste just as good! 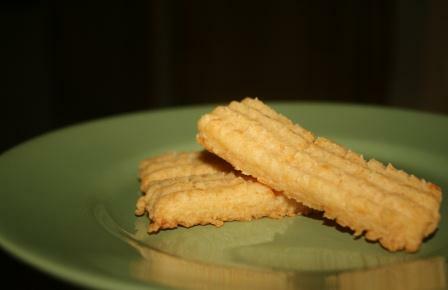 I love cheese straws and these sound easy to make - thanks! These look wonderful. I will have to make them in the fall when my husband's family comes to visit. They love cheese straws. I am so going to make this!! Thank you! So sorry about the loss of this job for you. It's so hard now. These look and sound wonderful! Glad they were a hit. I'll be praying that another door will open for you! These look YUM! I love cheese straws and I will definitely be trying these! i'm sorry about the loss of your pt job. i know gigs like that don't come around often. Uh - YUM! These look GOOD. Thx for sharing! Sorry to hear about the job, that stinks. Thinking of you guys and hope you find something else that works! These look wonderful!!! They sell these at Target, Archer Farms brand, and I do like them, but these would be a whole step above the store bought! I am sorry about that job, hope you can find something else maybe. I eat low carb so this recipe is right up my alley. I will make some this weekend. Sorry about the job going south. Maybe you will find something else. I'm sorry about the job--I hope something else will come along for you. Those cheese straws look wonderful--I am a mouse when it comes to cheese. Oh those sound super yummy! I might even up the cayenne dose. Oh my, those sounds so tasty. Oh wow... those look good and sound so easy. I need to check your blog for zucchini recipes, but today I am playing catch up. I was gone all day yesterday at the Cleveland Clinic with the Hubs. He will need knee surgery. I've made those and they are sooooo good. Those seem so yummy! I'm going to have to try them! Sorry about the part-time gig, though. Thank you for the recipe. I will be making this for our Sunday evening snack. It sounds like a winner. So sorry for your situation. However it is a story I hear very often of late. Even us old retired folks are having to cut back because that fixed income just does not go as far as it needs to. Having children really makes it harder because they do not yet understand about earnings and budgets etc.